As I have mentioned previously, I found eating in Vietnam a very frustrating affair, with the best Vietnamese food largely inaccessible to the average tourist. Sadly most tourists (who find themselves on the almost inescapable tourist trail that runs from Hồ Chí Minh City to Hạ Long Bay) leave the country with a scant appreciation of the full potential of Vietnamese cuisine, having being fed on an uninspired diet of spring rolls and, if you were lucky, some mediocre phở. These lacklustre experiences are especially tragic to those tourists who seek out new food experiences. Considering authentic Vietnamese food has such a wealth of flavour, it is a shame that there isn’t more of it on offer to the willing tourist! Coming from a South East Asian food culture where authentic street-food is accessible and transparent, I found the Vietnamese surprisingly guarded about their food – often openly discouraging you from joining them for a simple bowl of noodles on the side of the road, preferring to usher you back to the tourist cafés with their English menus and homogenised Vietnamese food. Which is why I love Bún Chả! Tasty, cheap and satisfying, Bún Chả makes for a great meal, but above all, Bún Chả is relatively accessible to foreigners on the prowl for some authentic street-food. It has been said that on the streets of Hanoi, “where there is smoke, there is Bún Chả!” and even if you only end up ordering it in a tourist café, it is still tasty and fun to eat! Second only to the almighty and omnipresent Phở Bò, Bún Chả is perhaps one of Vietnam’s most popular dishes, especially in the North of the country where it is thought to have originated from. 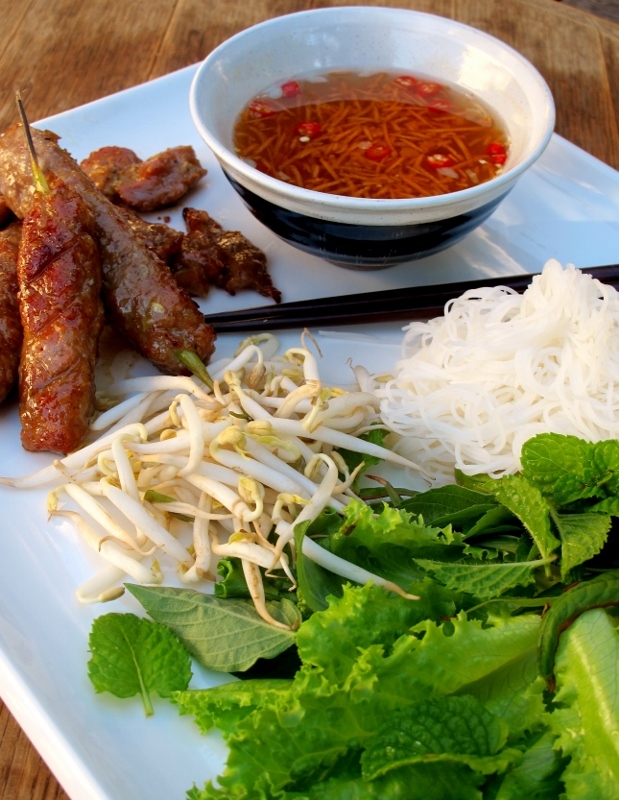 Made up of a plate of grilled pork, salad, a dipping sauce and bún noodles (rice vermicelli), Bún Chả is a complete meal in itself. Traditionally the meat takes the form of patties made up of pork mince, but I like to add some sliced pork to the dish as it adds an extra dimension to the overall meal. Whilst I am unsure of the exact etiquette for eating Bún Chả, I have taken to soaking the meat in the dipping sauce, adding a bit of the noodles, followed by some of the salad. Then, using chopsticks, everything gets shoved into my mouth. It certainly isn’t elegant, but it is damn tasty!